The Idea user will get these benefits on recharge of Rs 197/- unlimited local and STD calls with this plan along with this the user also gets daily 1 GB Data of 4G/3G/2G so there is no panic whether you are on 4G or 3G or 2G and the validity of this offer is for 28 days. 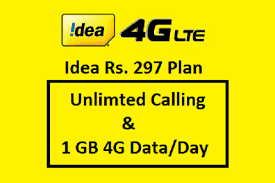 The Idea user will get these benefits on recharge of Rs 248/- unlimited Idea to Idea calling with this plan along with this the user also gets daily 1 GB Data of 4G/3G/2G so there is no panic whether you are on 4G or 3G or 2G and the validity of this offer is for 30 days. The Idea user will get these benefits on recharge of Rs 396/-unlimited Idea to Idea calling and if you want to call to other networks there will be free 3000 minutes(that means you wont be charged untill you finishes 3000 minutes to any other network other than Idea,these are both Local and STD calls) with this plan and the validity of this offer is for 70 days. Also Read about BSNL Ultra speed Broadband Services which will give 1GBPS download speed. All the above information may not be 100 % correct so you need to check with the official website or official Idea Sources.